Brooklyn Biscuit Tortoni: Born in Brooklyn, based in Florida, available at many fine dining establishments! When the chefs behind Brooklyn Biscuit Tortoni asked me if I would help them out by taste testing a few different versions of their product, I rolled up my sleeves, took a deep breath, and decided that out of the goodness and generosity of my heart, that I would grant them that favor. It is precisely moments like these that remind me of that cliche, “Do what you love and the money will follow.” While there isn’t paper money involved here per se, delicious tastes of dessert are worth way more than dollars as far as I’m concerned. I grew up in New York, where it was common to see tortoni on just about every pizza place or Italian restaurant menu. The choice was usually tortoni, spumoni, or cannoli, and given the option of dried, candied fruit and nuts in spumoni (yuck) or ricotta cheese filling of a cannoli (Um, ew. Why would I want cheese and carbs for dessert after presumably eating cheese and carbs for dinner? ), the choice was always clear to me. Add a single-serve sized paper cup that meant I didn’t have to share, a maraschino cherry and almond cookie crunchies on top and well, who could pass that up? I didn’t realize until many years later that at some point I stopped seeing these delightful treats on menus. I didn’t even realize how much I missed them until this dessert duo brought it to my attention by offering me a taste of their version of this classic. The first sample I had was creamy, cold, sweet, and sparked so many memories for me that I simply forgot to slow down and savor each bite. It was gone before I knew it and I was clearly NOT wearing my culinary taste-tester hat that day. I would definitely require another one to be able to give helpful feedback. The second sample was a different story. I was mentally prepared to take small bites and really let all five senses tune in. The crisp cookie crumbles on top were my favorite part. They are blended throughout the cup giving a slightly granular feel and keeping that almondy flavor consistent from top to bottom. I saved the cherry for last, as I always do with any cherry-topped dessert, and it was a wonderful last juicy bite. The taste is very similar to ice cream, but more like frozen custard with a slightly eggier quality to it. It’s sort of like someone melted one of those yummy, toasted almond, Good Humor popsicles, re-constituted it, used better quality ingredients, and then perfected that concept in a cup version. It was *almost* the perfect tortoni, but for me, someone who has a serious sweet tooth by the way, it was actually too sweet overall. Now that did not for one second mean that I left even one drop uneaten, it just meant that I actually had something other than a full rave to come back to the creators with. And so, that brings me to the final version. The chefs tweaked the original recipe that they used by reducing the amount of sugar and the amount of crumbled almond cookies by nearly half. They brought me my third and final sample. The moment of truth. I used a small spoon so as better to slow my bites down and to allow me to savor every delectable taste. Now this is perfection. Creamy, sweet but not-too-sweet, crispy, almondy, cold, and just the right portion size (although I could admittedly eat 2 or 3 of these easily- I really shouldn’t). This is a memory in a paper cup. A great memory…and now one that can live on in the present instead of only a distant past. Bravo! Arghhhh. TOTALLY unacceptable! I ate an awesome lunch here and completely forgot to take photos. Darn pregnancy brain. I will definitely need to go back asap to have the same meal again so I can provide the lovely, mouth-watering pics that should go with this entry. Please forgive me! Anyway, It was a GREAT meal! 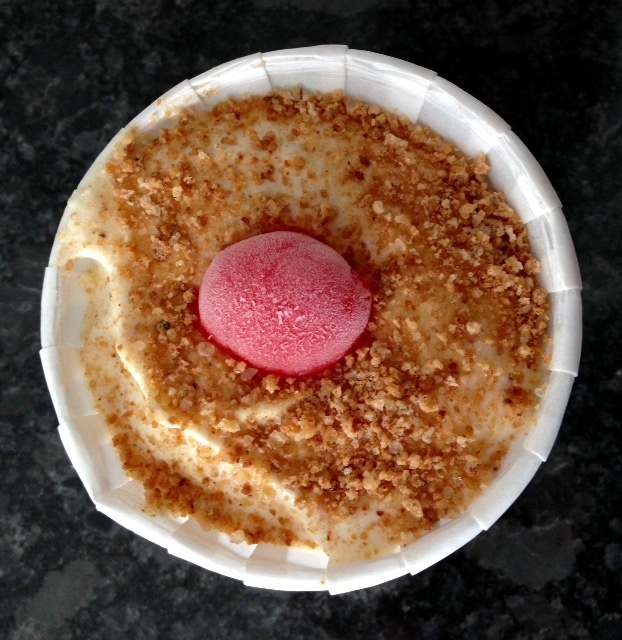 My father had recently stopped in and raved about the custard. He is like me in that when he finds a noteworthy meal or food, he basically insists that you take him seriously and go try it for yourself. Luckily, I am not one to deny the man the pleasure of passing on a new and delicious discovery to someone else. I stopped in and was pleased to find plenty of vegetarian options on the menu. I was also really pleased to see that almost all of the ingredients on the menu are locally sourced from farmers in the area. Very cool- and especially cool to see the map on the wall showing where each ingredient comes from. I easily decided on a portobello mushroom with a slice of provolone, pickles, ‘S’macks’ sauce (which is basically a kicked up mayo), lettuce, and tomatoes all on a yummy potato bun. I also ordered a side of fries and a lemonade. As I went to sit down to wait for my order, the owner was walking around passing out samples of their coconut custard and I couldn’t possibly turn that down. WOW. Super creamy with that hint of coconut threaded texture, just the right amount of sweet, the perfect temperature and consistency. Dad was right, it’s sooooooo good. If I hadn’t already told myself that the fries were the indulgence I was allowing myself today, I would totally have ordered a cup of the custard after I ate lunch. So then my meal arrived at my table looking amazing. The portobello sandwich was perfect- juicy mushroom, not drowning in cheese and sauce, topped with pickles and the fresh veggies that I requested. 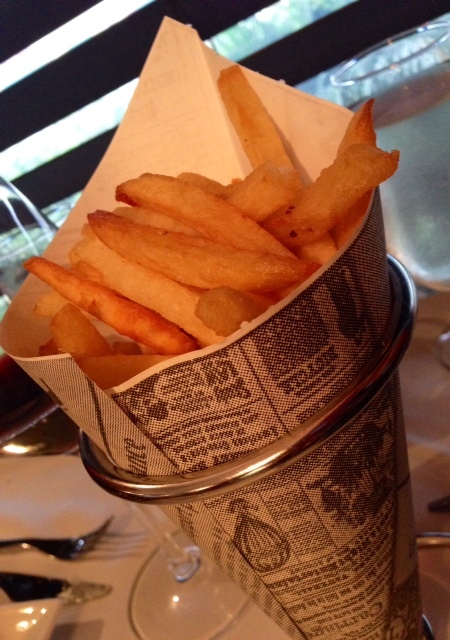 The fries were crispy and hot, crinkle cut, and super fresh. I was going to have this with my lemonade, but the owner brought me some peach iced tea that was refreshing and ice cold and it went really well with my meal..so I alternated between the two drinks. Even though I was stuffed at this point, how could I turn down the incredible coconut/chocolate shake he also brought over when I was done eating lunch?? I was only going to have a sip to taste it but….Well, the end of that story goes as predictably as you’d imagine. Overall, I am DEFINITELY a fan of S’macks and will surely be back soon. Actually, today is my day off from work and writing this entry up has sparked a craving…so I may just make it over there later today. Give it a try! You’d think I was totally setting myself up for disaster when I ended up going to Sardinia for lunch. I was REALLY craving Thai food, so I’d intended to go to my favorite, Isan Thai, not realizing that they are closed on Mondays. I had a limited amount of time on my lunch break, so I decided to try Sardinia even though I really wasn’t feeling like eating Italian food. When I went in, I was seated right away and the waitress brought me a menu and ice water. I looked over the lunch menu and was happy to see lots of delicious sounding vegetarian and pescatarian options and realized that my Thai craving had quickly disappeared. Most of the choices were around $10, very reasonable for a lovely selection. 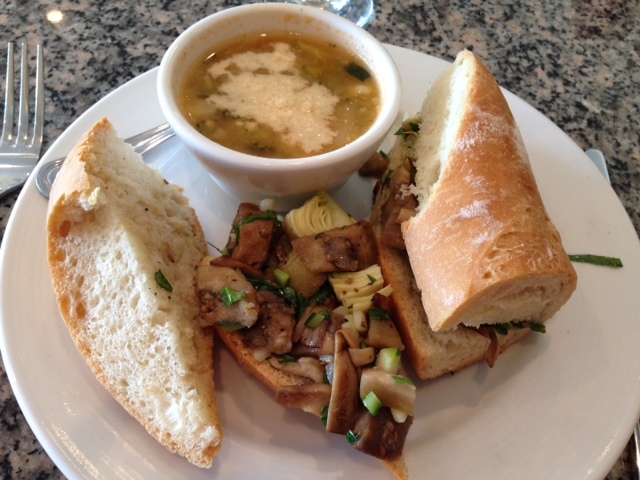 I ordered the Grilled Marinated Vegetable Sandwich with a cup of Minestrone soup. When it arrived, it looked and smelled awesome. The fresh baguette was crusty and warm, and filled with artichokes, zucchini and various other lightly roasted veggies with a small amount of excellent olive oil over the top. The Minestrone was basically just a light veggie soup topped with a sprinkle of fresh parmesan. The whole meal was very satisfying and a great value. I will definitely go back! 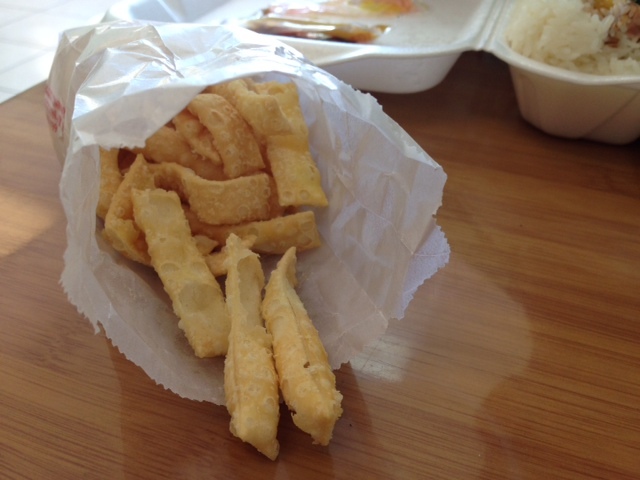 When I opened the bag of ‘crunchy noodles’ and found VERY stale ones instead, I was worried that this was a bad sign about the meal I was about to eat. Luckily, this was the ONLY part of the meal that I wasn’t impressed with. 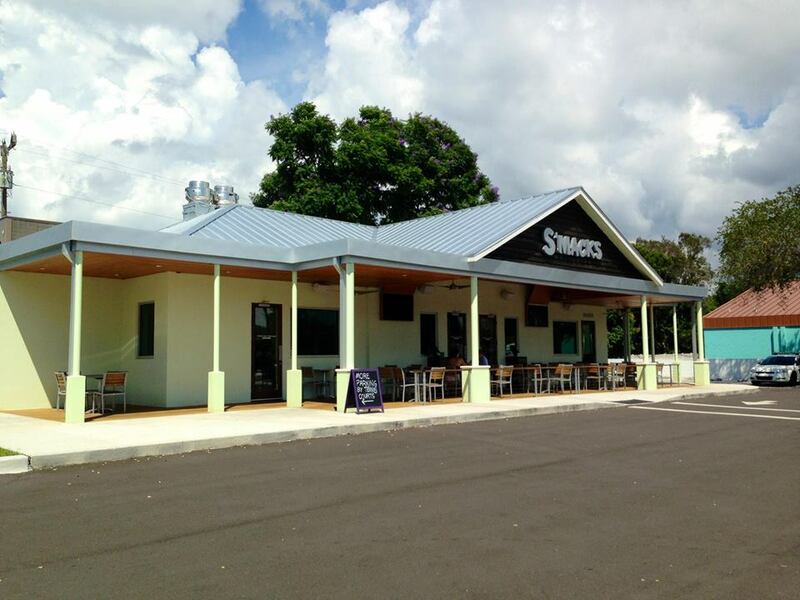 This little restaurant has turned out to be a very pleasant surprise in Lakewood Ranch. Most Chinese restaurants around here really stink..but the food served here (except for the crunchy noodles) is SUPER fresh, cooked to order, and quite delicious. 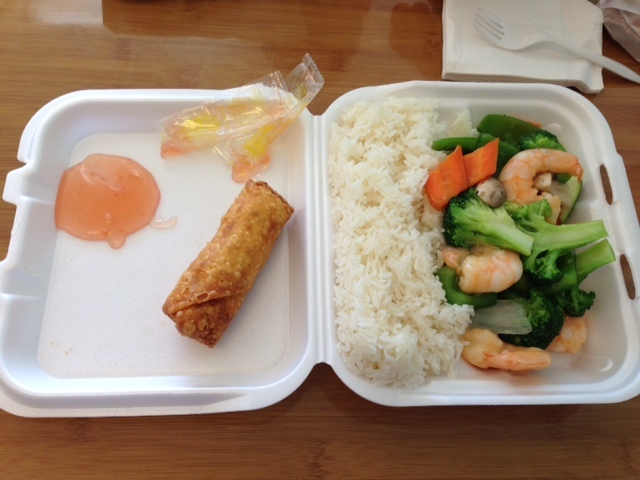 My husband and I order take-out frequently from Happy Dragon and have been consistently satisfied with everything we’ve tried. Nothing is drowning in sugary, over-seasoned sauces or oil. They take a lot of pride in serving only fresh ingredients- nothing from a can or frozen….so while you may be bummed that there are no baby corn or black straw mushrooms, I am happy knowing that the ingredients they cook with are the same as the ones I’d choose to use at home. I especially love the shrimp and eggplant in garlic sauce and the Mei Fun with vegetables. YUM. This is a great go-to place when you want Chinese food without the typical ohhh-I-wish-I-hadn’t-eaten-that feeling that usually comes an hour later. BRAVO Happy Dragon..We will see you again soon! 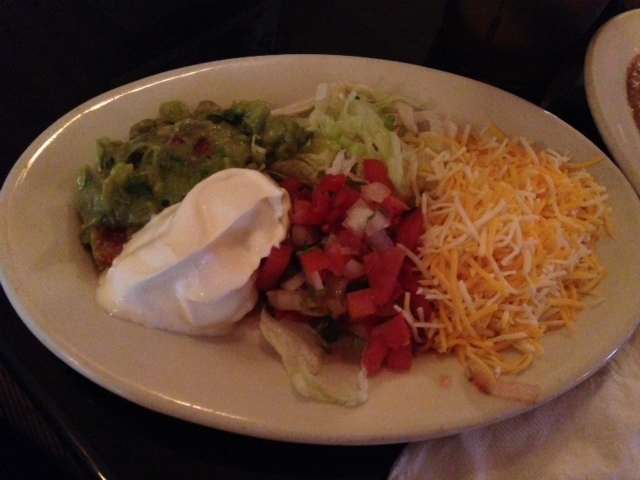 We’ve lived near here for almost 2 years and had never been to El Lago Ranchero before last week. We wanted to use a coupon we had for our old standby, Mi Pueblo, but it was closed. 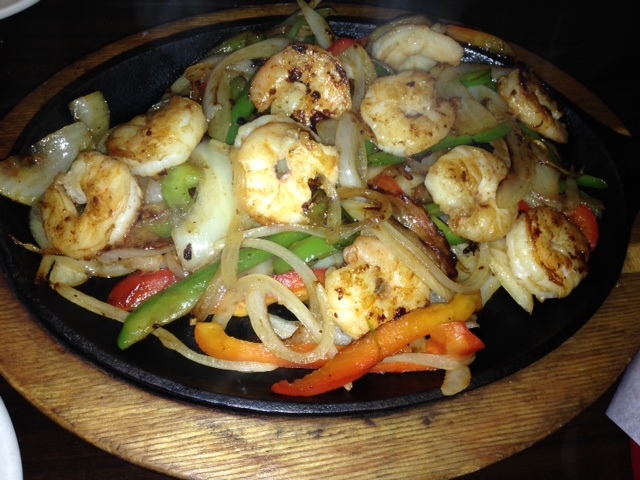 Still craving fajitas, we decided to give El Lago a shot, despite the fact that we’d heard it wasn’t that great. We were happy to find them open on a late afternoon and were seated immediately. Our waitress was fun and friendly, and brought us our drinks right away (including a sample taste of a margarita for Gabriel) as well as a basket of chips and salsa. We ordered the shrimp and veggie fajitas for 2, which came with sides of rice and refried beans, tortillas, and all of the typical toppings: cheese, sour cream, tomatoes/cilantro/onions, lettuce and guacamole. Everything was tasty, fresh, and was served quickly. Granted, we didn’t order anything particularly complex, and it’s hard to really mess up fajitas too much, but we really enjoyed it. 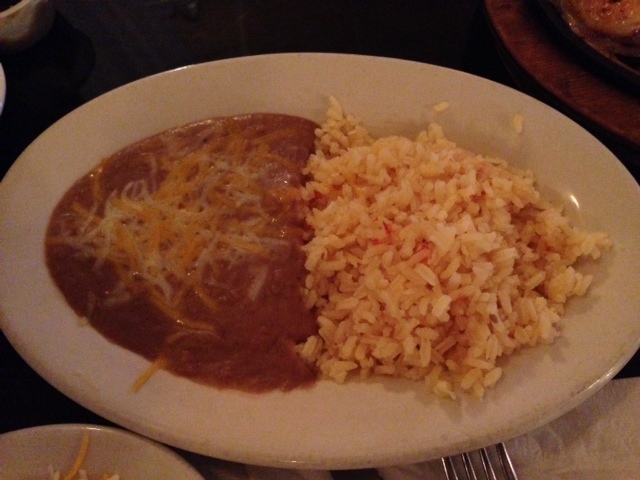 It’s definitely more Americanized Tex-Mex than authentic Mexican food…but there’s nothing wrong with that in my book. The shrimp were fresh and cooked well, the vegetables were fine, not over-seasoned or over-cooked, and the bill was very affordable. We will surely go back! Gabriel and I lived in a condo nearby to Antoine’s for a few months, and when it opened, I put it on my short list of restaurants I wanted to try. We never got around to it while we still lived over there, but about 6 months later, we happened to snag a Living Social deal to go…and finally cashed in on it last weekend. If you notice that the building looks an awful lot like a fast food joint from the outside, you’re very perceptive. It was apparently a KFC before the new owner gutted the interior and made it into an adorable, 12 table, fine dining restaurant. We made an early reservation and were greeted by the waiter, Olivier, when we arrived. There was only one other couple there, and we felt like we got VIP service right from the start. We were told that it’s staffed by only the one waiter, one chef and a dishwasher…Impressive, and the waiter clearly had a lot of pride in what he does. Unfortunately, as the evening went on, and the tiny restaurant filled up, the service we received got worse and worse. By the end of the meal, we sat at our table waiting with empty plates in front of us for more than 20 minutes before they were cleared. When I mentioned to the waiter that he could really use a busboy or another staffer’s help, he replied, “This is fine dining and people are used to good things taking a long time.” Ummm, no. I disagree. People who are paying $80 for a meal for 2 expect 5 star service throughout the meal, not only during the times when the restaurant is mostly empty. That said, our experience was excellent anyway, the food was some of the best I’ve had in Sarasota, and for that reason I wouldn’t hesitate to suggest it to others…but I would strongly encourage going early- before the place fills up. We started with an amuse bouche which was a carrot, bean soup that we both loved. It was just enough to make my hungry, pregnant tummy stop growling- but was thin and light…not so filling that it spoiled the courses that we ordered to follow. 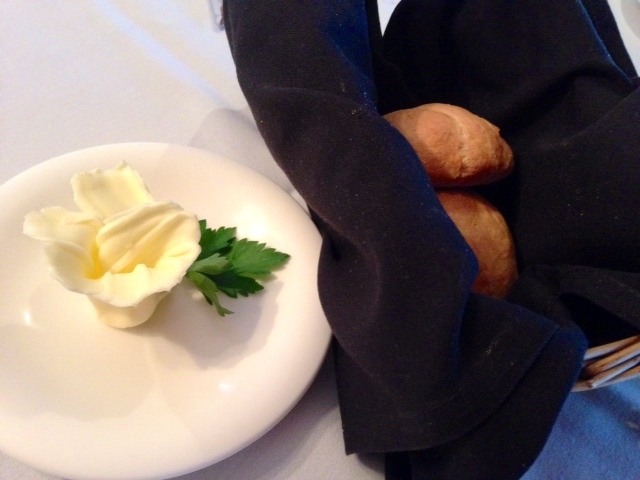 Next, we were served 2 warm, freshly baked rolls that were delicious along with a pat of butter shaped into a flower that the waiter proudly announced he’d sculpted just for me…very sweet until I heard him present it the same way to every other lady who sat down. Humph. I thought these rolls were quite delicious, but didn’t ask for more since we had ordered an appetizer and 2 entrees…However, a few days later, my father and his significant other went to dine there and asked for more the waiter brought out ONE more roll, cut in half. Huh? Then, when they asked for more again, they told they’d be charged for them. WHAT? No. Not ok. Not ever ok. That is just so cheap and pathetic. At a restaurant like this, PLEASE serve your guests as much bread as they want and don’t be so tacky as to try to charge for them. That’s really just appalling to me. For our appetizer we ordered a traditional escargot- which we both loved. The snails were fresh and the herby, butter sauce they were served in was full of flavor. If we weren’t worried about filling up before our entrees even arrived, we definitely would have asked for more bread at this point to sop that amazing sauce up with. 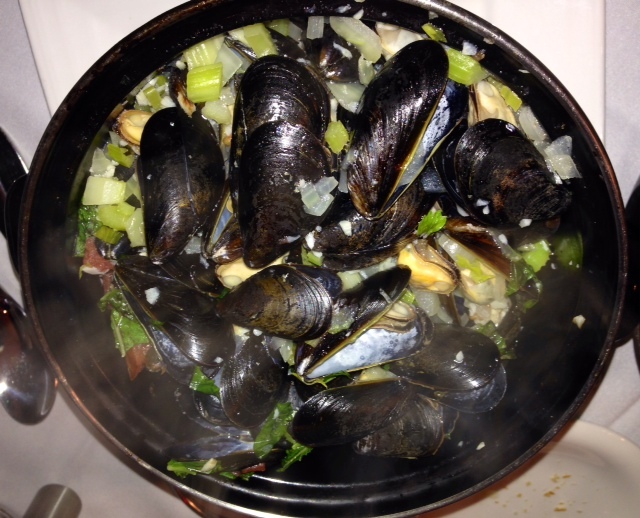 For our entrees, we HAD to order a pot of mussels- having loved them at Brasserie Belge (the owner’s previous restaurant) and also the fettucini with vegetables and shrimp (which we added at the waiter’s suggestion…and he was right, they were amazing). The pasta here is made to order, and it really showed. It was my favorite part of the meal. It’s touches like homemade pasta and seafood that arrives fresh daily, that make this a standout restaurant. Overall, I would absolutely recommend Antoine’s. 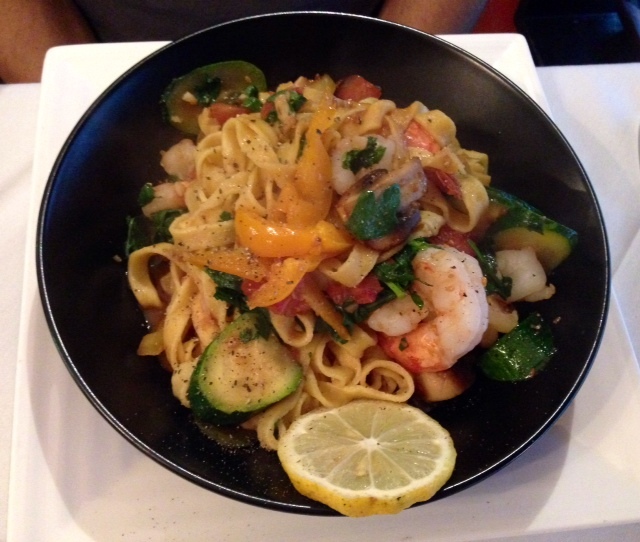 I think it’s a REAL standout in Sarasota purely because of the lovely, romantic atmosphere and the amazing food. That said, if you do, be warned that you WILL wait a long time for service if you go during ‘normal’ dinner hours, that you WILL spend a lot of money, and that you WILL pay for rolls if you want more than one per person, which again, I think is totally ridiculous. Other than that, enjoy…The food is truly top quality and if it wasn’t so pricey that it can’t really be a regular spot for me, I would totally go back frequently. If you go, let me know what you think! 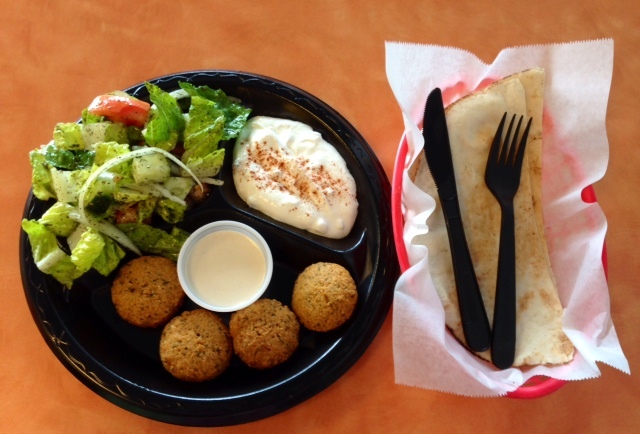 I had a craving for falafel a couple of weeks ago, so I headed for the one place I know of to get some for lunch, a little cafe called Zante Gyros on Superior Ave. When I got there I was surprised to see it was gone. Out of business. Kaput. Bummer! I was already short on time on my lunch break and quickly checked Yelp for another choice close by. I found great ratings for Oasis, and drove over. I arrived to find a small, casual, take-out cafe with a few tables and booths to sit at. I ordered a falafel platter with sides of Mediterranean salad and Tzatiki. It came with pita and 4 pieces of falafel. It was all pretty good, but nothing spectacular. The pita was regular, store-bought pita. 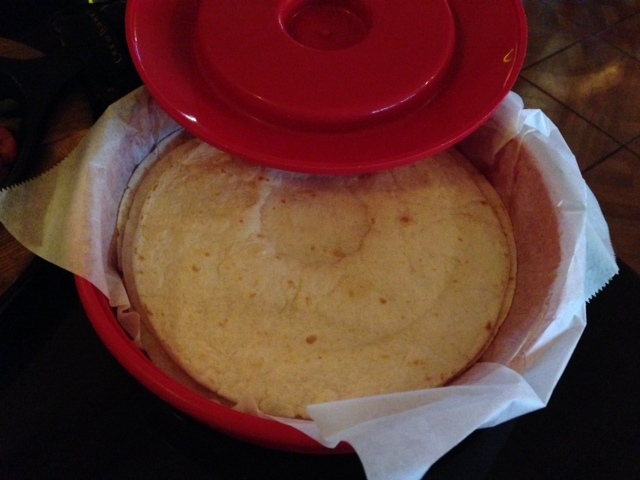 When you’ve had homemade, fresh, warm pita (like the kind they have at Pyramida in NYC), that makes just about everything else shy in comparison. The tzatiki was alright- but it was a bit tangy for my liking, and there wasn’t enough chopped cucumber in it. The falafel and salad were good and made fresh to order. Overall, I might go there again in a pinch, but I think I’ll keep looking for another one that’s even better.